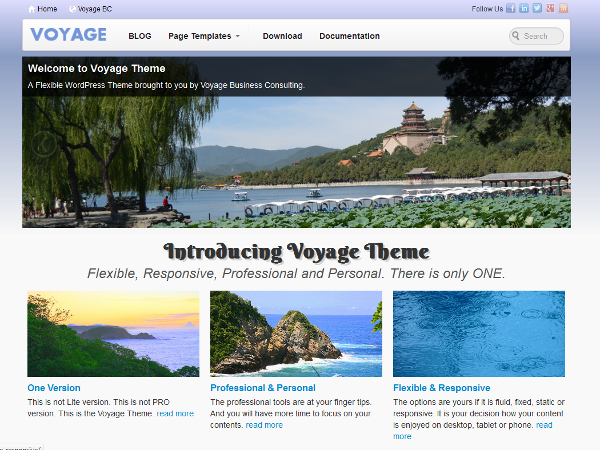 Voyage Theme is a flexible and responsive framework that combines a modified version of 960.gs and Twitter Bootstrap. It allows users changing layout and style using flexible and simple options: 1-, 2- or 3-column blog layout; fixed, fluid or responsive; grid width, color schemes, fonts (including Google Fonts) and many more. Voyage features 15 widget areas, 4 menu positions, 5 color schemes and 10 page templates including Featured Home, Landing Page, Full-Screen, Portfolio, Image Slider with template options. Voyage Theme includes 3 highly customizable widgets (Recent Post, Navigation Tab and Social), Colorbox and Font Awesome. It has build-in support to popular plugins such as Jetpack Sharing, WooCommerce, Jigoshop, Breadcrumb NavXT, bbPress and BuddyPress.